In a landmark health and productivity study, a group of preventive medicine and workplace health experts found depression was the costliest health condition to employers in terms of total workplace costs. Their work found that workplace productivity was significantly impacted by behavioral health issues, such as depression, substance abuse, anxiety, stress and disrupted sleep1. Since then, the adverse effects of behavioral health problems on the well-being of our workforce has become even more evident. In fact, behavioral health problems are a leading cause of illness and disability. Fortunately for us all, a parallel line of research has demonstrated that employers can implement workplace strategies and services that promote good behavioral health practices, minimize total workplace costs, and provide early and efficient referrals for treatment2. Nearly one in five US Adults experienced a mental, behavioral, or emotional disorder in the past year3. Even more alarming, 71% of those in the workforce suffering from these conditions have never reached out for help for their illness4. These disorders cost employers both directly and indirectly, presenting opportunities for employers and health plans to support the well-being of their employees with proven and effective health management programming. Employees suffering from depression and stress have health expenditures that are 70% and 46% higher, respectively, than their healthier counterparts5. In 2006, the Agency for Healthcare Research and Quality estimated that $57.5 billion was spent on mental health care in the United States6. With nearly 28 million workers experiencing a mental or substance abuse disorder, employers bear a substantial portion of these direct costs7. In addition, the financial impact of the indirect costs weighs heavily on employers. These indirect costs include workers’ compensation, short- and long-term disability, presenteeism and absenteeism6,8. In one study, employees suffering from depression missed an average of 4.8 work days and suffered 11.5 days of reduced productivity over a three-month period9. And, sadly, other studies have found that most of the employees suffering from mental health conditions do not reach out for help with their illness4. The broad scope and high impact of mental health conditions on the well-being and productivity of employees presents a critical opportunity for employers and health plans to bring mental health focused health management programming to alleviate the distress and improve outcomes. The symptoms of a behavioral health problem can manifest themselves in many ways. Conditions may affect a person’s thinking, feeling, or mood. Some are severe and disabling; while others are mild. Some may affect someone’s ability to relate to others and function each day. Employers can train their managers to recognize some of the more common red flags of common conditions, like depression and anxiety, to help them properly and effectively engage their employees when concerns arise. Screening tools can be built into employee health plan health risk assessments or provided in a secure and confidential manner for individual use by employees. By identifying and working with individuals early, treatment of reversible conditions can be started, and other symptoms can be addressed, leading to a healthier way of life both personally and professionally. Research has shown that behavioral health treatment can help empower people to live better lives. Employers who bring workplace health tools to their employees are well-served by thinking strategically around a total health approach – addressing and integrating employee physical and mental health. Employers need to think outside the st andard health and wellness programs and implement strategies that encourage people to think about their emotional health. Some experts feel a necessary first step is for employers to recognize and break down the organizational barriers that prevent them from taking proactive approaches to managing workplace behavioral health problems. This proves to be difficult, as many employers feel ambivalent about their role in the management of common behavioral health problems like depression, much in the same way that employees may be hesitant to seek help for behavioral health conditions. Reducing the personal and organizational stigma often associated with mental health problems is a necessary strategy to benefit from utilizing workplace behavioral health tools to address behavioral health challenges11. Employees participating in disease management and wellness programs can work with their coaches to identify symptoms in their earliest stages and be encouraged to seek treatment. This is a proven, cost-effective method to improve employee well-being. 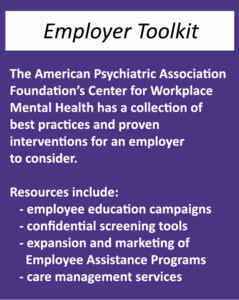 These services require health coaches to integrate physical with mental health, develop a trusting relationship with the employee, support the employee’s development of coping skills, provide education materials, encourage the employee to seek professional help when indicated and assist the employee with necessary professional referrals. The coach should also evaluate the member’s current support system to ensure they have the proper team supporting them. Coaches capable of taking a total health approach help employees recognize the challenges they face due to mental illness and work with them to overcome the stigma of the illness. Effective health coaches pinpoint triggers in medication adherence and behavior shifts, supporting the employee’s development of self-management skills. 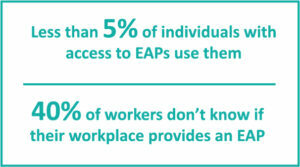 Employee Assistance Programs (EAPs) are a valuable resource available to employers dedicated to the total well-being of their employees. Although the original focus for EAPs was alcohol and substance abuse counseling, they have expanded their scope into multiservice programs that include addressing behavioral health problems that a ffect job performance. EAPs offer short-term, confidential, behavioral counseling in person or by telephone. Employees may be referred by their supervisor or self-refer. In some circumstances, short-term counseling will adequately address an employee’s need, but in others, the employee may be referred to behavioral health treatment outside the EAP and provided follow-up support as needed. Employers who are working with an EAP will be well served by an outreach program that includes manager training to increase EAP awareness, works to reduce the stigma toward behavioral health problems, and communicates clearly the confidentiality and utility of the EAP. This visible commitment to employee total well-being will have a positive effect on EAP utilization by all employees in need of EAP services. In addition to formal workplace health tools, the use of management strategies to mitigate workplace-related stress from demanding work environments, high work demand and a poor social climate also present an opportunity for change. Employee health outcomes are influenced not just by personal behavioral patterns but also by perceptions of work and experiences in the workplace. Employee behavioral health is as much a management concern as it is a health concern12. With nearly 20% of employees in the workforce suffering from a behavioral health illness, now is the time to address these conditions to turn the tide. Employers may not be able to fully remove the stigma of behavioral illness, but they can initiate the culture change and invest in quality health and wellness programs where early identification and referrals to treatment can be encouraged and facilitated. 1Loeppke R, Taitel M, Haufle V, et.al. Health and productivity as a business strategy: a multiemployer study. JOEM 2009; 51(4): 411-428. 2Harnois,G, Phyllis G. Mental health and work : impact, issues and good practices. World Health Organization 2002. Geneva, Switzerland. 4Pratt LA, Brody DJ. Depression in the United States household population, 2005—2006. Hyattsville: National Center for Health Statistics: NCHS Data Brief No. 7; 2008. http://www.cdc.gov/nchs/data/databriefs/db07.htm. 5Goetzel RZ, Anderson DR, Whitmer RW, et. al. The relationship between modifiable health risks and health care expenditures. J Occup Environ Med. 1998;40: 843–854. 6Soni, A. The Five Most Costly Conditions, 1996 and 2006: Estimates for the U.S. Civilian Noninstitutionalized Population. Statistical Brief #248. Rockville, MD: Agency for Healthcare Research and Quality; 2009. http://www.meps.ahrq.gov/mepsweb/data_files/publications/st248/stat248.pdf. 7Herz, RP, Baker, CL. 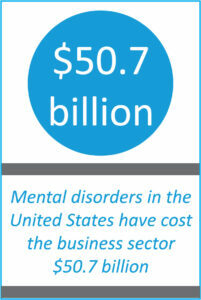 The Impact of Mental Disorders on Work, Pfizer Facts series, June 2002. This report is an analysis of the National Comorbidity Survey data, 1990-1992, Institute for Social Research, University of Michigan, funded by the National Institute of Mental Health and the National Institute of Drug Abuse, and the W.T. Grant Foundation; 2002. 8Chapman LS. Presenteeism and its role in worksite health promotion. Am J Health Promot. 2005;19(4): suppl 1-8. 11Putnam K, McKibbin L. Managing workplace depression: an untapped opportunity for occupational health professionals. AAOHN Journal. 2004;52(3): 122-129. 12Dunnagan T, Peterson M, Haynes G. Mental health issues in the workplace: a case for a new managerial approach. J Occup Environ Med. 2001;43:1073-1080.